In a context of a continually widening range of disciplines and subjects available for learners to specialize in, it becomes increasingly critical for the value of particular subjects to be examined. Thus, while debates rage over the relevance and worth of school history, we contribute to the conceptualization of what school history is for. In other words, we examine what history learners acquire as a result of studying the subject. We argue that learners gain a certain form of historical literacy which cannot always be generalized to different contexts. As such, the historical literacy that learners gain varies according to context, place and time. In this article we specifically review literature related to the functional realm of History Education and, particularly, historical literacy. We then construct benchmarks of historical literacy as informed by the literature. This research thus avails a foundation for further empirical research on the purpose of school history. Keywords: History; Historical literacy; Conceptual understanding; Historical consciousness; Historical language; History education. One of the enduring questions that history learners and educators face is: "What is the purpose of studying History at school?" This question in most cases may come from critics of the subject. However, history educators also have to ask themselves this question if they want to build an understanding of their subjects by both proponents and detractors (Husbands, Kitson & Pendry, 2003). Only then can we develop a serviceable conceptualisation of what it is that learners acquire through studying history. In an attempt to provide an answer of sorts to this question we have delved into what can best be described as the functional realm of history education by examining the notion of historical literacy; and, specifically the available literature pertaining to it. In this article we argue that the concept historical literacy is contextualised, and cannot be viewed as universal - being the same for all regardless of, for example, place and time. The roots for this ambiguity not only lie in the diverse views on what the purpose of studying history at school level is, but also in the mere idea of what it means to be literate in history (Ravitch, 1989; Wineburg, 1991; Rüsen, 1993; Taylor, 2003). We thus trace the roots of historical literacy, ultimately coming up with a conceptualisation of its benchmarks. Literacy studies do not have a long history outside the languages. The concept of literacy has quickly, albeit belatedly, gained ground in some subjects, such as science and mathematics, but it can be argued to be still negotiating its place in history (Taylor, 2003). Hence, in order to understand the concept that is historical literacy, one has to grasp its origin in the context of other literacies and its development over time. To gain a bigger picture, it is necessary to understand literacy as a general concept. Studies on literacy have demonstrated how complex defining the concept can be. Clifford (1984, p. 472) illustrated how literacy had thus far evolved from being a preserve of "old men and monks," to a concept whose meaning ranges from elitist to inclusivist. As elitist concept, literacy is supposed to be attained by a very restricted portion of the population as its definition is tightened to connote the highest attainable standards. In such cases, the elite will also have political power, along with it many other forms of influence such as economic and religious power. Thus, literacy becomes a cultural tool, without which the ordinary populace are excluded from either enjoying the benefits of or confronting the challenges of the society within which they live. On the other hand, as inclusivist concept, literacy is not perceived as a tool to alienate people. This means that in an inclusivist form, the definition of literacy is made simpler and broadened; such that an individual who can insert an X on a document as signature, without necessarily being able to fully comprehend the contents of the document, is deemed to be literate. The opposite is true for elitist notions of literacy whereby only a select elite are deemed literate thereby enabling them to rise to the upper echelons of society. Variations of both elitist and inclusivist conceptions of literacy are demonstrated across various countries. For example, while for many years the UNESCO measurement of literacy is based on the level of education people has reached, politicians in different countries may interpret it differently, some in campaigns to be lauded for eradicating illiteracy (Roberts, 1995). For the reasons discussed above, the meaning of literacy may be argued to be very ambiguous (Hillerich, 1976). The major question that tends to arise recurrently is how literacy should be measured, if it can reliably be measured at all. In other words, where does one draw the line between a literate individual and an illiterate one? Street & Lefstein (2007) explain how a dichotomous notion of literacy implies a syndrome on the illiterate individuals who will then require some form of treatment to remedy their malady. One response to this dilemma came from Hillerich (1976) who refuted the existence of a literacy/illiteracy dichotomy. In an attempt not to be exclusivist, he proposed a continuum of literacy model which meant that one would not need to draw an iron curtain to separate the literate from the literate. Instead, the continuum implies that people can be positioned at different levels of literacy in ascending or descending order. While the continuum apparently solves the literacy/illiteracy dilemma, it is not free from criticism either. What complicates the issue most is what level of aptitude can be considered to be the lowest standard for a literate individual. In other words, although the achievement standards are simplified and lowered, one will still need to draw a line where an individual may be deemed totally illiterate. In addition, the developmental stages of a literacy continuum are fraught with complications. It suggests that one's literacy develops in a sequence of predetermined and predictable stages. This model may entail still having to come up with a measuring instrument in order to determine a person's level of literacy (Clifford, 1984). All these considerations illustrate the complications related to attempting at coming up with a single and generic understanding of the concept literacy. (a) a heightening of qualitative standards of literacy to encompass higher order cognitive processes; (b) a broadening of the social and individual purposes that literacy is intended to serve; and (c) an extending of the literate from religious and scholarly elites to the whole population (p. 482). The above quotation suggests that, with time, the notion of literacy has broadened to encompass other competencies which might not necessarily have been considered earlier. The apparent result of this development is that literacy has now been extended to other disciplines resulting in new conceptions such as "television literacy", "computer literacy", "scientific literacy" and "historical literacy" (Clifford, 1984, p. 481). This view of literacy implies the existence of multiliteracies thus acknowledging varying versions of literacy (Cope & Kalantzis, 2005). The wide-ranging nature of literacy had been fortified by the late 1990s as the concept was no longer limited to the languages only. According to Roberts (1995, p. 413) "a more productive line of inquiry would be to consider how literacy has been constructed, shaped and discussed, by whom, when, where, and why." This argument is valuable in that it rightly concludes that the conceptualisation of literacy - be it scientific, mathematical or historical - crucially depends on the time, space and context under study. Furthermore, Roberts (1995) argued that there are three major conceptions in literacy studies; that is, the quantitative, qualitative, and pluralist. The quantitative measure of literacy is based on figures and an example of this would be when scholars measure learners' reading ages. Social scientists, however, came up with an alternative range of qualitative definitions of literacy. Of these, the description by Gudschinsky (1976, as cited in Roberts, 1995, p. 429) revealed that the most important aspects of literacy are speaking, reading, writing and understanding. It should be noted that speaking, reading and writing are skills. Therefore, early ideas of literacy were primarily grounded in skills acquisition. However, Roberts (1995, p. 418) preferred the pluralist approach to literacy which "concentrates on describing in a more general way the 'features' or 'dimensions' of literacy and the literate person." The quantitative notion of measuring literacy is, in a way, related to the literacy/illiteracy dichotomy. For example, if one is of a certain age, but has not attained the corresponding reading age, the individual is considered illiterate. The qualitative notion can be correlated to the continuum conception of literacy. Evidently, it assumes that a person develops from speaking to reading, through writing until they develop to reach the pinnacle of literacy which, in this case, is understanding. Considering the weaknesses these two notions have been identified to have, the pluralist notion offers a different and more convincing view. The strength of the pluralist approach is that it does not consider literacy to be continuum, but rather a construction made-up of several building blocks. In relation to Hillerich's (1976) continuum of literacy in general, Kaiser & Willander (2005, as cited in Madongo, 2007, pp. 33-34) identify and develop five levels of literacy which are: "illiteracy", "nominal literacy", "functional literacy", "conceptual and procedural literacy", and "multidimensional literacy" - in respective order. What this continuum suggests is a rejection of the literacy/illiteracy dichotomy and hence it is inclusivist. However, it has already been pointed out that one of the weaknesses associated with this continuum type of outline is the assumption that the stages of development are fixed and predictable. Although the characteristics of an individual within each stage of literacy are enumerated, they remain subjective. The above discussion on the concept literacy serves as a useful background to understanding and conceptualising historical literacy. It is therefore on that basis that this paper aims at conceptualising historical literacy and this conceptualisation will be achieved through a review of literature related to the concept of historical literacy. The literature summarily reviewed above does not directly deal with historical literacy; however it is critical in understanding the debates surrounding literacy in general before the notion of historical literacy can be interrogated. In continuation from the above, in this section we will contend that there is a difference between literacy in history and historical literacy. While the former refers to the ability to read and write while studying school history, the latter implies what someone gains from studying school history. In presenting this argument, we will commence with a brief analysis of the evolving meanings of the concept of historical literacy from the point of view of the major theorists. The template that we will use for this is that we will firstly identify a major theorist and the time they put forward their theorisation. We will then analyse how the theorists conceptualised historical literacy. After that we will review the context within which each theory was propounded. Finally, we will highlight the major strengths and weaknesses of the conceptualisation, the connection between the different conceptualisations and how they built up on each other. To begin with, a summary of the major theorists and the evolving meanings of historical literacy are revealed in the timeline in Figure 1. Evidently each of the theorists has a different view of what school history is for. It is noteworthy that although the theorists on the timeline constitute the significant researchers in relation to historical literacy specifically, they are not the only ones to have contributed to the discussions. Indeed, some scholars might not have explicitly used the term historical literacy, but their role in the theorisation of related notions is nonetheless important. As Figure 1 illustrates, the scholars on the top row of the timeline referred directly to the concept historical literacy, while the scholars in the bottom row have theorised history education such that their arguments feed into historical literacy as a construct. Therefore, it would be folly to argue that before the term historical literacy was coined, or outside its perimeters, scholars were not and are not trying to understand what the ultimate achievement in the study of school history is from a functional perspective. With this in mind, their input will be viewed as it feeds into the arguments of the main scholars on historical literacy as identified above. The argument on historical literacy as championed by Scheiber (1978) did not take root back then in the 1970s. However, just over a decade later, a strong standpoint emerged as argued for by Ravitch (1989) that historical literacy refers to levels of historical content knowledge, that is, an accumulation of facts about past events. This argument can be connected to historical knowledge as a form of historical literacy. Only in recent years has the mere knowledge of past events begun to be questioned globally as an authentic grasp of school history. Although the term historical literacy is still developing, the knowledge of a certain body facts of the past was, for centuries, the hallmark of the knowledge of history. This was the core of Ravitch's (1989) argument when she decried the low levels of historical factual knowledge among contemporary American students. She claimed that "some information is so basic, so essential that all students must know it in order to make sense of new learning" (Ravitch, 1989, p. 53). Therefore, according to the Ravitch (1989) school of thought, historical knowledge is equivalent to historical literacy. Ravitch's (1989) point of view is not entirely new. It has been common for some historians to tend to lament what Ravitch & Finn (1998, as cited in Wineburg, 2000, p. 33) term the contemporary generation's "shameful ignorance" while celebrating the nostalgia of a "presumed golden age of fact retention." This argument was strengthened in the 1980s with the results of the Scholastic Aptitude Tests (SATs) in the USA which concluded that American students displayed disappointingly deteriorating knowledge of historical information that is presumed basic and common knowledge. So alarmingly bad were these results in some circles that scholars - significantly Hirsch (1988, p. 22) - declared American education, along with it, the economy and "civilisation" in crisis and consequently branded the contemporary students as "a generation of cultural illiterates." The opposite of cultural illiteracy, as Hirsch (1988, p. 22) called it, was cultural ignorance which rendered students unable to "thrive in the modern world." This conception resonates with the literacy/illiteracy dichotomy explained earlier. The argument was that illiteracy had emerged in the last half of the 20th century and that students should know basic facts on "geographical names, historical events, famous people, patriotic lore, and scientific terms" (Hirsch, as cited in Sleeter & Grant, 1991, p. 228). While literacy is critically useful in determining a learner's fate in relation to overcoming contemporary challenges, Hirsch's (1988) doomsday prediction is rather too alarmist. Indeed, Aronowitz & Giroux (1991) dismiss Hirsch (1988) together with other scholars such as Bennett, Ravitch, Finn and Glazer as conservatives who are responding to their perceived threat of post-modernism which has served to undermine the meta-narratives of what should be known. There are a number of contentions in relation to the issue of so-called shameful ignorance. For example, Wineburg (2000) reveals that actual research does not demonstrate any substantial change in learners' historical factual knowledge over time, but rather that even during the times of Socrates, the youth were being blamed for lacking something that the older generation possesses. This view continues up to today. In response to the lamentation of older generations about the younger generations' apparent lack of historical knowledge Wertsch (2006, p. 55) put forward the "schematic narrative templates" which, he argued, are "a means for understanding differences as well as commonalities between the two generations" in terms of historical knowledge. His contention is that although older generations may claim to (and apparently) have more memory of historical facts; in reality their knowledge might not be very different if it falls within one schematic narrative template. Wertsch (2006, p. 57) gives the example of Soviet Union school history students and post-Soviet Union students whereby the latter group apparently seemed to be deficient in content knowledge, when in actual fact the two groups could retell their history within the same "'triumph-over-alien-forces' narrative." In response to the likes of Ravitch (1989) and Hirsch (1988) a new dimension was added to the conceptualisation of literacy in general and historical literacy in particular. Aronowitz & Giroux (1991, p. 227) start by acknowledging and agreeing with Hirsch (1988) that any definition of literacy should embrace "a particular relationship between knowledge and power." This will then imply that any crisis of literacy - that is if it ever exists - should be defined primarily as an "epistemological and political problem." However, that is where the agreement ends. Aronowitz & Giroux (1991, p. 229) then took issue with Hirsch (1988) for simplistically calculating that "cultural literacy is the precondition for industrial growth, and that with industrial growth comes the standardisation of language, culture, and learning." Not only is this considered a baffling case of historical determinism, it is also based on an assumption of Western culture as "egalitarian and homogeneous." The crux of Aronowitz & Giroux's (1991, p. 233) argument is that if historical literacy is conceptualised as was done by Hirsch (1988) and Ravitch (1989), then history turns out to be "a museum of information that merely legitimates a particular view of history as a sacred goods designed to be received rather than interrogated by students." In other words, history should be a territory for academic struggle and any historically literate individual should be able to partake in this struggle. To acknowledge different forms of literacy is not to suggest that they should all be given equal weight. ... This presents a form of literacy that is not merely epistemological, but also deeply political and eminently pedagogical. It is political because literacy represents a set of practices that can provide the conditions through which people can be empowered or disempowered. It is pedagogical because literacy always involves social relations in which learning takes place; power legitimates a particular view of the world, and privilege legitimates a specific rendering of knowledge. It is apparent that the conceptualisation of the notion of historical literacy by Aronowitz & Giroux (1991) is different to that by Ravitch (1989). Historical literacy was now being considered as not universal and was manifested by individuals' ability to make use of their history to empower themselves. The meaning of the notion of historical literacy was developed further by Wineburg (1991) who argued that the concept goes well beyond mere recall of facts as was the argument by Ravitch (1989). His contention was that the key to historical literacy is what he referred to as the three heuristics - sourcing, corroboration and contextualisation. Evidently, this implies a sort of historical literacy continuum whereby sourcing would represent the lowest level of literacy, and contextualisation the highest. The allusion, therefore, is that on top of historical knowledge an individual needs to be able to work with historical sources, as is expected of professional historians in order to achieve historical literacy. Sourcing refers to "noticing and evaluating the source of the document" (Wineburg, 1991, as cited in Perfetti et al., 1994, p. 262). In other words, these are enquiry methods and processes that one needs to be able to practice in order to be a historian. Therefore, it would be difficult to label a learner who does not know how to gather sources or information as a historically literate person. Corroboration denotes an historical investigation whereby a historically literate person "check[s] the facts mentioned in the document against those in other documents" (Perfetti et al., 1994, p. 262). To further develop this notion, corroboration involves checking the information gathered against information from other sources resulting in the development of multi-perspectives. Boix-Mansilla (2000, p. 406) calls this an ability to apply "historical modes of thinking." In doing this, one should be aware of the strengths and weaknesses of the particular sources. The third step as identified by Wineburg (1991) is contextualisation which means setting "events in a larger context" (Perfetti et al., 1994, p. 262). Without the ability to apply this method, an individual may tend to view the past as made up of unconnected events. According to Lee (2004), contextualisation is a major indicator of historical literacy which many students struggle to achieve. A solution to this is for learners to have an usable framework of the past which enables them (learners) to set events in a "big picture" which, in turn, enables them to "go beyond fragmentary extrapolation from the very recent past" (Lee, 2004, p. 8). A historically literate individual should picture the past not only as a story, but also as a map so that history is contextualized within space and time (Shemilt, 2000, p. 94). Wineburg's (1991) conceptualisation was a big step in the evolution of historical literacy from viewing it as mere content knowledge to knowledge coupled with the application of historical investigative processes. This development was cumulative rather than subtractive since Wineburg (1991) did not view knowledge as unimportant. Instead, he contended that historical knowledge without the understanding and application of actual historical technique is not as useful as was assumed by Ravitch (1989). The reason for this argument is that knowledge is obtained from historical sources. It is noteworthy that Wineburg's (1991) emphasis on the use of sources came in a context of the development of skills-based curricula in many countries in the wake of Shemilt's (1980; 1983; 1987) far-reaching work in the School Councils History Project (SHP) in Britain in the 1980s. Evidence of this frame of thinking is the move away from memorisation and regurgitation of historical facts towards increased amount of source work with which history learners had to engage with as historians. 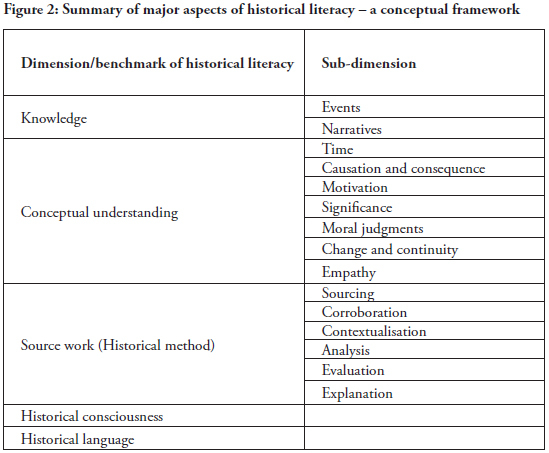 The next major step in the conceptualisation of historical literacy was initiated by Taylor (2003) who drew up an index in which historical literacy was presented as a combination of a range of criteria. It should be noted that prior to his theorisation, Taylor was head of a project at Monash University to investigate the quality and status of teaching and learning of history in Australia whose report was produced in May 2000. This inquiry team was set up as a result over concerns, starting in the mid-1990s in Australia, that school history was failing to thrive (Taylor, 2000). Taking a cue from this project, Taylor (2003) proceeded and conceptualised historical literacy in attempt to theorise and, in the process, come up with an instrument to measure individuals' historical literacy. His arguments also built on the theorisations that had already been done by earlier history education scholars such as Ravitch (1989) and Wineburg (1991). At the apex of his index of historical literacy, Taylor (2003) placed knowledge of the events of the past. He admitted the useful role played by what may be termed prior knowledge, which learners come to school with from mainly unofficial sources (Phillips, 2006). This implies an acknowledgement of what Lowenthal (1998, as cited in Virta, 2008, p. 124) dismissed as "amateur scholarship." The placement of knowledge of past events at the top of the index shows how fundamental Taylor considers knowledge to be in historical literacy. 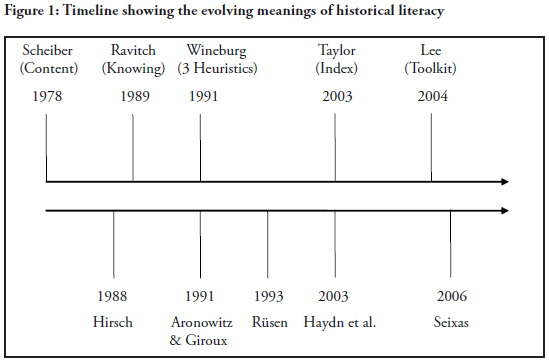 The cumulative evolution of the concept of historical literacy is also demonstrated when Taylor (2003) modified Wineburg's (1991) heuristics. While he steered clear of using the term heuristics, Taylor (2003) still refers to them, although his focus is mainly on the understanding and use of historical skills. He acknowledges research skills to be crucial, in the process defining them as "gathering, analysing and using the evidence (artefacts, documents and graphics) and issues of provenance" (p. 6). Clearly, there is a similarity between Taylor's (2003) "research skills" and Wineburg's (1991) "sourcing." Taylor (2003) furthermore argued the importance of historical method and skills by pointing out that a history learner should be able to use historical reasoning, synthesis and interpretation to explain historical events. This means that historical literacy also implies the ability to make sense of the sources and to show why each event happened in its own context. Taylor (2003) went further than Wineburg (1991) through being more specific about the sources to which one applies historical method. One such aspect from his index is the use of applied science to determine the way historical events occurred. Therefore, according to Taylor (2003, p. 1) "understanding the use and the value of scientific and technological expertise and methods in investigating the past" is a sign of historical literacy. Although history and science are disciplines which are quite distinct, being able to use science to explain historical events is according to Taylor (2003) proving to be a kind of historical literacy. It must be noted though that there are problems related to this view. For example, the use of science in the social sciences may lead to learners not grasping the historical process (the unpredictability of events) well. Science also does not tell us about attitudes of past people. In any case, many third world countries will need some time before they can afford to conduct hard scientific studies in history. Hence, although being able to use science to explain the past enhances historical literacy, not using it does not necessarily render one historically illiterate. This proves the argument that historical literacy comprises a number of (sometimes) independent building blocks, depending on the context. Historical understanding is one conspicuously dominant idea throughout Taylor's (2003) index of historical literacy. For example, he identified as a characteristic of historical literacy "understanding the shape of change and continuity over time, understanding multiple narratives and dealing with open-endedness" (p. 6). This implies that an individual who myopically reproduces a single narrative of events lacks critical literacy in history. This view has gained ground as a result of the application of post-modernist and deconstructionist theories in history championed by scholars such as Foucault (Munslow, 1997). The post-modernist philosophy challenged the existence and use of grand narratives (or meta-narratives) in history. At varying degrees historians have come to compromise and accept the use of multiple narratives instead of grand narratives in history. Related to this point is the "understanding (of) historical concepts such as causation and motivation" (Taylor, 2003, p. 6). Haydn, Arthur & Hunt (2003), in resonance with Taylor (2003), added that the major concepts that enhance historical understanding are time, evidence, causation/consequence, change/continuity, significance and understanding events and issues from the perspective of people in the past/ making moral judgements on people of the past. This proposal on concepts was a major development in identifying the purpose of school history despite Haydn et al. (2003) not mentioning historical literacy directly. Their work, mainly done in Britain, was in a context of a reworking of the nature of school history which resulted in a concept-based history curriculum. Concept-based school history was a departure, though not major, from the skills and method based school history of the 1980s and 90s. These concepts are known as second order concepts, and they differ from first order concepts such as revolution, nationalism and slavery. Lévesque (2005, p. 1) states that second order concepts "implicitly arise in the act of doing historical inquiries" and "are necessary to engage in investigations and to anchor historical narratives (or interpretations) of the past". Because of their significance to the conceptualisation of historical literacy, the second order concepts will henceforth be reviewed individually. The first concept that Haydn et al. (2003) put forward is significance - arguing that for history learners to study the subject with understanding, they should comprehend the significance of that particular subject and its content. Therefore history learners should "appreciate how the topic they are studying contributes to their education, informs and explains issues that are both serious and significant to their own lives" (Haydn et al, 2003, p. 120). Their argument was that even if the learners may tend to not recall all factual detail which Ravitch (1989) held so dear, realising the significance of historical events is "the enduring educational outcome" (Haydn et al., p. 96). Levstik (2000, p. 284) noted the link between historical literacy and power - as viewed by Hirsch (1988) and Aronowitz & Giroux (1991) - by stating that "decisions about what is historically significant have as much to do with what is repressed as with what is recollected." This can be demonstrated by the language (such as the use of the first person plural "we" or choice of images which could be meant for nation building or emphasis of certain issues or individuals). Ultimately the history learner should have answers to the questions like "why are we studying this?" (Hunt, 2003, p. 33) or "what is school history for?" (Husbands, et al, 2003). This implies that understanding the concept of the significance of history and historical events contributes a great deal to a learner's historical literacy. Bradshaw (2007) argued that for learners to learn real historical significance they should not have it dictated, but they should be given the chance to make their own decisions about the significance of historical events. The centrality of the concept of time in the study of history was underscored by both Taylor (2003) and Haydn et al. (2003, p. 97), the latter contending that "if pupils are to make sense of history, they need to have some idea about how we 'measure' and reference events in history in terms of when they occurred, and to build up a mental framework of the past." This would mean that historically literate individuals understand time right from "deep time," that is, "the distant past stretching back to prehistory, the Stone Age and the formation of the Earth" Haydn et al. (2003, p. 97). According to Taylor (2003, p. 11), if an individual is exposed to sound historical learning, they develop the capacity to confidently and correctly apply period labels. This implies an understanding of chronology, sequencing and time markers such as GMT, AD, BC, generation, century, era and epoch. Evidently, understanding the concept of time will have to imply some linguistic and mathematical literacy as well (Wood, 1995; Dawson, 2006). It is also the hallmark of an individual who is historically literate to be able to identify and avoid anachronism and presentism. Presentism implying looking into the past using eyes contextualised in the present world (Partington, 1980). Hence, using the pluralist approach to literacy, understanding the concept of time in history is a key building block of historical literacy. In addition to time, the concept of change is crucial to historical literacy. According to Taylor (2003, p. 9) the epitome of understanding change and continuity is the appreciation of "change as the gradual transformation of a situation." In corroboration, Haydn et al. (2003, p. 116) identified a link comprehension between the concept of change and continuity and the structure and content of the "syllabus" when they stated that "if a syllabus is not chronological (i.e. is episodic), it makes it difficult for learners to understand change and continuity." In support of this position, Barton (2001, p. 881) adds that one needs a certain set of "cultural tools" in order for them to understand the complexity of the process of change. It is the possession of such cultural tools that enables individuals to be historically literate. The concept of causation was also singled out by both Taylor (2003) as a key component of achieving historical literacy and by Haydn et al. (2003) as a key component of school history. The latter alleges that most highly intelligent adolescents treat the word "cause" as though it refers not to the connection between events but to the properties of one of the events. Taylor (2003, p. 9) likewise concluded that the epitome of a historically literate learner, in terms of understanding causation, is the understanding that causes are "an intricate network of actions and factors." They will have developed from assuming that history is linear and events are inevitable. In addition, Evans & Pate (2007) argued that although learners need scaffolding in order for them to develop good causation arguments, although over-scaffolding ends up being retrogressive. A perplexing paradox that has dogged school history is that on one hand school history has been forced to carry the burden of developing responsible citizens. On the other hand, learners are not encouraged to make moral judgments on people who lived in the past. Making moral judgments is one of the characteristics of a responsible citizen and this was identified by Taylor (2003) as part of his index of historical literacy. On the contrary, von Borries (1994, p. 346) remarked that "moralising obstructs historical explanations" because moral evaluations and historical judgments are not necessarily the same. Moralising leads to anachronisms as learners try to impose today's values on societies whose experiences led to the morals the learners are trying to use, he argued. Thus, one can identify two contrary arguments regarding moral judgments. While Taylor (2003) considered understanding moral issues in history as a sign of historical literacy, von Borries (1994) considered avoiding the making of moral judgments to be a sign of historical literacy. Taylor (2003) went further than Haydn, et al's (2003) second order concepts by bringing to the fore the relevance of historical skills and the importance of the language of history as key components of historical literacy. According to Taylor (2003, p. 6) "understanding and dealing with the language of the past" is a distinguishing attribute of a historically literate learner. This is because history, as with other specialisations, has its own unique language. For example, the meaning ascribed to the word "revolution" in history may differ to that in mathematics. It is these distinctive communication features which "render the accumulation of valid historical understandings problematic for many students" (Husbands, 1996, p. 30). The historically literate learner should be aware of the fact that language in history can have multiple meanings. Husbands (1996) likewise contended that history learners should understand how language shapes history and how history in turn shapes language. Therefore, while it is important that history learners comprehend historical language, language itself can depict our understanding of history. The use of historical language is related to presentation of the historical narrative. The narrative has seemingly since time-immemorial been the main assessment genre of historical communication; thus being able to construct one was a sign of historical literacy. Jacott, Lopez-Manjon & Carretero (2000) maintained that the narrative is still important today. Good presentation of a historical narrative is not necessarily about perfect grammar only, but it must also show multi-narratives and should follow the structural model (Jacott et al., 2000). The structural model entails explaining history "based on the relationship between a set of conditions" as opposed to attributing historical developments to human action. Taylor's (2003) index explained on representational expression whereby historical creativity is expressed through film, drama, visual arts, music, fiction, poetry and information and communications technology (ICT). His argument is that "history is not merely a written or spoken narrative" (Taylor's 2003, p. 33). It is debatable whether creativity can be taken to be historical literacy; however this is defended with the deconstructionist argument that all narratives are not real representations of the past. Therefore, in spite of the digital divide which means that many parts of Africa for example have little or no access to ICT, Taylor (2003) considers ICT to be important in history. Such arguments expose the plurality of historical literacy where certain benchmarks are important in some contexts but can not be generalised to all contexts. In some circles, historians and history educators (Laville, 2006, Seixas, 2006; Simon, 2006; Phillips, 2006) have focused on theorising historical consciousness. It is important to discuss historical consciousness, firstly, because in some instances it is mentioned almost interchangeably with historical literacy. Secondly, some theorists use historical consciousness as a component part of historical literacy (Lee, 2004). The chief protagonist - though not the first - of historical consciousness is Rüsen (1993, as cited in von Borries, p. 345) who describes history as a "complex network of interpreted past, perceived present and expected future." In its own right, the idea of historical consciousness has had a wide-ranging conceptualisation such that it is difficult to pin down one agreed upon definition or meaning. This is compounded by a lot of history education scholars' relative lack of exposure to Rüsen's (1993) work since most of it is written in German (Lee, 2004). Despite this, historical consciousness gained huge ground in the 1990s, a watershed period in the history of Europe in particular and the world in general. With the demise of the Soviet Union, and subsequently the unification of Germany, there was a marked change in the role of history in many societies and with this, the way history as a discipline was viewed. As a result, the notion of historical consciousness gained ground in countries that needed to rethink the role of history in their past, present and future (Laville, 2006). Indeed, Rüsen (1993) is identified to have been one of the first to call for a single European monetary currency which would strengthen a European cultural currency which, he argued, developed from a common historical consciousness. As the theorisation of historical consciousness continued, questions arose whether historical consciousness and historical literacy are just but two different sides of the same coin. Seixas (2006, p. 11) understands historical consciousness to be "individual and collective understandings of the past, the cognitive and cultural factors that shape those understandings, as well as the relations of historical understandings to those of the present and the future." This conceptualisation can be equated to the clearer and workable understanding provided by the Youth and History Project (as cited by Wassermann, 2008, p. 143) which labelled historical consciousness simply as "the connection between the past, the present and the future." These two explanations clearly demonstrate the way historical consciousness can not be a direct equivalent of historical literacy. Instead, this notion has been developing either at least as parallel or at most as part of historical literacy if one adopts the pluralist view of literacy. In this case, historical consciousness becomes a building block of historical literacy which can be related to Wineburg's (1991) contextualisation because a historically conscious individual will be assumed to be able to contextualise themselves in the unfolding history. Although Taylor (2003, p. 6) did not specifically name historical consciousness, in his index, he indirectly refers to it under the aspect on "connecting the past with the self and the world today." This might be viewed not to be exactly how Rüsen (1993) or Seixas (2006) conceptualised historical literacy since there is no mention of the future. Hence, the crux of Taylor's (2003) index of historical literacy hinges on the intersection between historical knowledge, historical understanding, historical consciousness and historical method. This theorisation also demonstrates the cumulative development of the concept of historical literacy over time. Lee (2004) has argued on the contrary that historical consciousness is critical in the conceptualisation and development of historical literacy. Lee's (2004) conceptualisation of historical literacy can be argued to be the most recent theorisation of the concept. Curiously, there is no evidence of a current groundswell of research from different theorists in this field. This should not be interpreted as a sign of the loss of impetus of the concept of historical literacy. On the contrary, it should be interpreted as a gap in a fertile field which is calling for further research and conceptualisation. Reasons for the modest research on historical literacy may include the nature of school history which is set, not only by history educationists, but also by powerful voices in society such as politicians and governments who are not easily challenged. This is evidenced by a lot of critical thinking in school history in times of crises, especially political. The contexts of major theorisations in the USA, Australia, Canada and Germany, by the likes of Ravitch (1989), Wineburg (1991), Rüsen (1993) and Taylor (2003) attest to this. The above review of the available research revealed that literacy - and hence historical literacy - can be viewed, firstly, as a literacy/illiteracy dichotomy, secondly, as a continuum or thirdly, as composed of building blocks. These three views fittingly tally with ideas of historical literacy as defined from quantitative, qualitative or pluralist standpoints respectively. We would argue for the pluralist notion of historical literacy which implies historical literacy that is made up of various component building blocks as expounded by Roberts (1995). Therefore, historical literacy must not be viewed as easily dichotomous in that one is only ever classified as either literate or illiterate as explained by Clifford (1984) since such an idea is exclusivist. Neither do we assume that historical literacy develops through predestined and predictable stages and in a linear fashion until one attains the highest possible level of literacy as propounded by Hillerich (1976). Both the exclusivist and continuum notions of historical literacy imply quantification of the concept. However, the literature reviewed demonstrates that there is no agreed way of quantifying historical literacy. Therefore, one can argue that it is possible to get a qualitative description of historical literacy without attempting to quantify it. Another major question for consideration is whether historical literacy should be regarded as a competency or as a subject of study like mathematical literacy as adopted by some scholars (Hobden, 2007; Madongo, 2007). It can be concluded that at no point have the history education theorists that were reviewed suggested that historical literacy should turn out to be a separate field of study. This is despite all the debates about the relevance of school history and the challenges it receives from more vocational-oriented subjects such as commercial subjects (Rabb, 2004).What all the theorists agree upon is that historical literacy is the embodiment of what a learner acquires through the learning of school history. What they differ on, in some cases, is what it is that the learners should acquire through studying history. Furthermore we argue that it would be myopic to attempt to come up with one generic definition of historical literacy. As already mentioned, contexts and circumstances have a major say in how historical literacy is viewed in a particular society. This is the reason why the meaning of the concept has been evolving, and there is no reason to assume that the evolution has ended. Quantitative conceptions of historical literacy suggest attempts at a one-size-fits-all definition of the concept. On the contrary, the adoption of a qualitative conception of historical literacy implies an admission that historical literacy is flux and it means dissimilar things to do diverse people in different times, spaces and contexts. Therefore, conceptually manifold manifestations of historical literacy exist. In continuation we argue that historical content knowledge alone is an insufficient yardstick for the achievement of historical literacy. We therefore contend that if other factors such as historical understanding are built upon content knowledge they become crucial to historical literacy. This does not imply, nevertheless, that historical understanding is equal to historical literacy. In fact, the former can be taken to be a component of the latter. To avoid the risk, created by conceiving historical literacy as a dichotomy or a continuum, of erroneously labelling the majority of people in the study of history - never mind the world - historically illiterate, a position is taken whereby people can be said to posses various notions of historical literacy. In other words, historical literacy can be metaphorically equated to a house and whether the house is double-storey or not, it remains a house. The additional storeys are there, in some cases, to add value without necessarily changing the generic nature of the structure. It was also pointed out that Hirsch (1988) and Aronowitz & Giroux (1991) agreed that any definition of literacy should not be separated from power. Indeed, the powerful sectors of society construct historical literacy for the rest. The powerful groups could be politicians who ensure that historical literacy may be seen as the ability to justify and defend existing political dispensations. However, while not downplaying the role of politicians it should be noted that scholars also hog a considerable amount of power which they can use to push their own conceptions of historical literacy down the throats of those who imbibe the contents of their textbooks. Therefore, we recognise the role of power, be it political or epistemological, in the determination of historical literacy. The theorisation of the concept of historical literacy according to our contention has been summarised in Figure 2. The figure shows how historical literacy can be viewed to consist of dimensions or benchmarks, with each having its own sub-dimensions. The first benchmark of historical literacy is historical content knowledge, which in turn comprises historical events and narratives as sub-dimensions. Knowledge of events implies the learners' ability to remember occurrences of the past. Knowledge of narratives reveals whether the learner follows grand-narratives or multiple-narratives. This dimension tallies with the views of Ravitch (1989). The second benchmark of historical literacy is historical conceptual understanding. This is largely based on the work of Haydn et al. (2003) and Taylor (2003). The important historical second-order concepts are the sub-dimensions and these are time, causation and consequence, motivation, significance, change and continuity, empathy and moral judgments. Application of historical method is the third benchmark of historical literacy. It implies working with historical sources. The sub-dimensions of this benchmark include Wineburg's (1991) heuristics which are sourcing, corroboration and contextualisation. The other three sub-dimensions which are analysis, evaluation and explanation are founded on Taylor's (2003) index of historical literacy. Historical consciousness was adopted as the fourth benchmark of historical literacy. Historical consciousness is viewed as a mental construct which is a manifestation rather than the equivalent of historical literacy. This conceptualisation is based on the simple understanding of historical consciousness as connecting the past, the present and future. This is thus linked to Taylor's (2003) making of connections. The final benchmark of historical literacy is the understanding and use of historical language. We argue that history can have a unique language. In other instances, though, the language is sometimes grounded in technicalities and can be related to other disciplines such as mathematics. The above has been an attempt (through a literature review) to conceptualise historical literacy, particularly explaining how historical literacy can be developed in learners without necessarily following a linear process. The dimensions of historical literacy are both dependent and independent on each other. For example historical understanding is grounded in content knowledge. Meanwhile methods are applied on content knowledge and understanding, but knowledge and understanding can be increased through the use of historical methods such as sourcing, corroboration or contextualisation. However, if one does not possess the capacity to contextualise it does not mean that they abruptly cease to be historically literate. On the contrary, while the individual's historical literacy will be less complex, at least it will still be there in another form. This is what is meant by multiple-literacies. In addition, all these dimensions are contextualised and carry different meanings in different spaces, times and contexts. The literature that has been reviewed on historical literacy shows wide-ranging international theorisation of the concept. However, one should not just adopt these theorisations uncritically and try and apply them in new situations. For example, the digital divide is a reality that makes it fallacious to assume that the use of film and ICT and gas and chromatography tests are presently being practiced in African school history in particular. In conclusion there are multiple manifestations of historical literacy and these can be qualitatively described according to context, space and time.